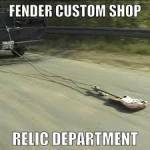 Fender® Forums • View topic - DIY relic tips? Post subject: DIY relic tips? I’m currently working on my 54 American vintage strat. It was semi relic’d when I got it. I want to give it a heavy relic look but the few I’ve done before I can never get it 100% like the custom shop stuff. This one is really thin nitro with no poly under coat. So the finish comes off nicely but I can never get to look like it wasn’t scraped off with a blade or sharp object. How do the custom shop guys do it? How do you guys do it? I’m trying to post pics of what I’m talking about and will post as soon as I figure out pics. Post subject: Re: DIY relic tips? Obviously the top pic is mine and the bottom pic is the 59 strat look I’m after. See how the 59 custom shop, the paint just fades away and mine has a white line I guess between where the paint ends and the dirt starts. Any tips on how they blend it without sanding and blending? I have no idea how they do it, and I assume they don't want to share their secrets. But think about how it happens naturally. The edges thin due to gentle abrasion -- your arm, clothes, case lining rubbing against them. Chips and scrapes start off with proud jagged edges, then feather down over time. It seems to me that a dry cloth buffing wheel (no polishing compound) might simulate that. A much riskier approach would be a cloth, cotton ball, Q-Tip just lightly dampened with acetone. Wipe gently from the bare wood into the paint. You'd really want to practice that on an inconspicuous spot first -- it might turn out horribly wrong. But I'm sure there are actual old guitars that have had acetone or other solvents spilled on them. And actually, solvent damage is a big contributor. Colognes, bug spray, wiping your fingers through the greasy hair gels people used to use, wrecked the finishes on lots of old guitars. It looks decent to me now. You could just play the crap out of it for a few years. Honestly, the CS Rories don't look a lot more real than that to me. The first pic is my guitar that I’ve already started on. The 2nd pic is a 59 master built I was going off for reference. I’m familiar with the chemical, sand papers, dyes and polish. Just wondering how they get the edge finish in the 2nd pic. Like what are they using to get that edge look. I can’t see someone spending 40 hours with a pick working away at it. As stated... a buffing wheel is involved. Most DIY methods tend to be too harsh and end up not looking natural. Play it like you stole it, and it will naturally end up looking worn. If you're into fashion statements then you might as well do what's in my avatar. You'll be asking how to preserve the worn finish because of playing it next, and yes, it did happen a few years ago on this forum.